Faster treatment could have saved the life of a 78-year-old woman who waited more than nine hours for an ambulance, a coroner has said. Diana Gudgeon died on 25 May 2018, two days after calling 111 with symptoms of a water infection and sepsis. A Northampton coroner has raised concerns over how her emergency call was graded and an ambulance shortage. 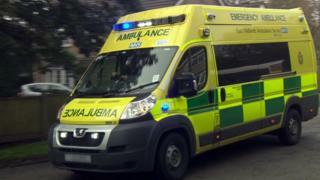 East Midlands Ambulance Service said it was recruiting more staff to plug the "fundamental gap" in its resources. Northampton assistant coroner Hassan Shah issued the Regulation 28 report, intended to prevent future deaths, to the non-emergency 111 and ambulance services. He said Mrs Gudgeon had "collapsed, passed out, been confused and had been vomiting" when she called 111, which passed her call to the EMAS call centre. "These are signs of central nervous/neurological problems but were not regarded as urgent," wrote Mr Shah. Mrs Gudgeon's first call was categorised as requiring a 120-minute response. A nurse called at 23:42 BST and was told Mrs Gudgeon may be suffering from a urinary tract infection but the call was not escalated. The ambulance service was dealing with a high volume of calls and had activated its "capacity management plan", but it did not lead to extra resources. A single responder arrived at Mrs Gudgeon's home at 04:50 the following morning, and a double-crewed ambulance at 06:28. Paramedics recognised signs of infection and sepsis and she was taken to Northampton General Hospital, arriving at 07:10. She died of multi-organ failure two days later. Mr Shah's report highlighted that an intensive care consultant said earlier antibiotic treatment "may have saved her life". EMAS said its fleet was short by six double-crewed ambulances and four fast-response vehicles at the time. Mick Jones, a service delivery manager at the ambulance service, said more than 200 new frontline recruits had been made since new funding was granted by commissioners last year, with the same number expected in 2019-20. "We know this comes too late for Mrs Gudgeon and her family and deeply regret this," he said.